Learn about the life of the people of the Southeast Native Americans also referred to as the Southeast Woodland tribes. Discover facts and information about the natural resources available, the languages, culture, clothing, their religion, beliefs and ceremonies. Pictures and images illustrating the Southeast Native Americans culture. This section on the Southeast Native Americans group provides facts and information about their languages, the Geography and Environment which was basically a humid, fertile agricultural region. The animals of the area and the Plants, Trees and Crops provided their food, clothing, shelter and decorations. Their Houses, Shelters and Homes depended on the materials available to them and whether the home was permanent or temporary. The Southeast area was perfect for growing many crops including maize, beans, squash and tobacco. There are also facts and info about the Religion, Ceremonies and Beliefs of the Southeast Native Americans group. The language of the Southeast Native Americans was Muskogean which was spoken by indigenous tribes including the Cherokee, Chickasaw, Choctaw, Creek and Seminole who are often referred to as the Five Civilized Tribes. The climate, land and natural resources that were available to the Indian tribes resulted in the adoption of the Southeast Native Americans culture. The languages of the Southeast Native Americans included Siouan, Algonquian, Caddoan, Uto-Aztecan and Athabaskan. Discover facts about each of these Southeast Indian Tribes. The physical characteristics of Southeast Indians are dark brown eyes, prominent cheek bones, straight black hair, and scantiness of beard. The skin color of Native Indians varies from very light in some tribes such as the Cheyenne, to almost black in others, such as the Caddo and a yellowish color in such as the Flatheads. The Geography and Environment can be generally described as a humid, fertile agricultural region. The region offers mountains, rivers and forests in the north and grasses and swamps in the south including the Everglades swamp in what is now the State of Florida. The climate is hot in the summer and mild in the winter. The animals were very important to the Southeast Native Americans. The animals available to the Southeast Indians included rabbits, wild hogs, turkeys, eagles, opossums, raccoons, squirrels and deer. The uses of the animals were varied and included food, clothing, shelter and decorations. The food eaten by the Southeast Native Americans included corn bread, hominy grits, tomatoes, potatoes and sweet potatoes. Turkeys also supplemented their diets. The different types of Houses, Shelters and Homes depended on the materials available and whether the home was permanent or temporary. The homes of the Southeast Indians included Wattle and Daub houses and chickees. 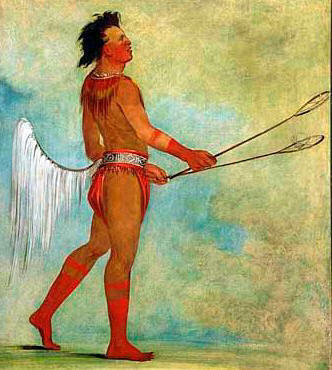 The Seminole tribes often lived in small villages consisting of chickees, a communal eating house and storage facilities. The Caddo lived in the famous 'Beehive' Thatched Grass Houses. The Religion, Ceremonies and Beliefs were based on Animism. Animism was a commonly shared doctrine, or belief, of the indigenous people of North America and Canada including the Southeast Indian tribes. Animism is based on the spiritual or religious idea that the universe and all natural objects have souls or spirits. In this religion it is believed that souls or spirits exist not only in humans but also in animals, plants, trees, rocks etc. This belief is also extended to natural phenomena such as thunder storms and rain and geographic features such as mountains, caves or rivers also possess souls or spirits. Tricksters feature in the legends and mythology of the Southeast peoples as do heroic figures or "transformers" who transform, or change, the world into its present state. They also have stories about councils of animals. The Religion, Ceremonies and Beliefs of the Southeast Indian tribes were also dominated by Shamanism in which a religious leader called a Shaman acted as a medium between the visible and spirit worlds. The Green Corn Festival was one of the most important ceremonies of the Southeast Indians. The festival was celebrated in the fall. 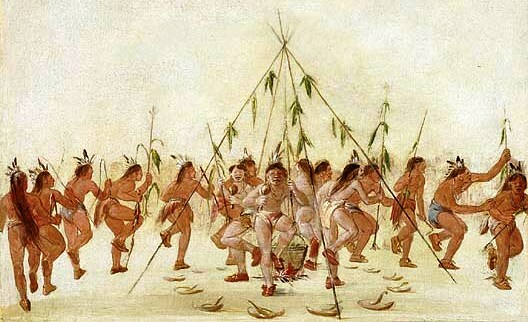 Chanting shamans and dancing warriors circled a cooking fire, carrying corn as can be seen by the above picture. After cooking the corn it was presented as a sacred offering to the Great Spirit. A new fire was built and enough corn for the entire village was made whilst people danced in celebration. The Southeast Native Americans! Discover the vast selection of pictures and videos of Southeast Native Americans. The pictures show the clothing, weapons and decorations of various Southeast Native Americans that can be used as a really useful educational resource for kids and children of all ages. Our series of videos enable fast access to the images, pics, paintings and pictures together with information and many facts. 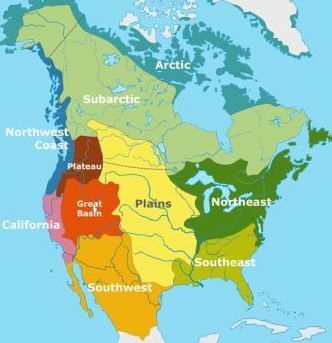 We hope that this article on Southeast Native Americans will assist in your studies or homework and that you will enjoy watching the videos featuring many pictures of the Southeast Native Americans. A great educational resource for kids on the subject of Southeast Native Americans.